The Burj Al Arab – the only 7-star hotel in the world offers unparalleled and divine luxury to guests for whom cost is not a factor. Those with a bottomless bank account can afford the heavenly comfort of the suites, the delectable cuisines served in the restaurants, access to nearby resorts and other facilities. The hotel's high profile clientele come to the hotel's spa and health when they are looking for some “relaxation and rejuvenation”. 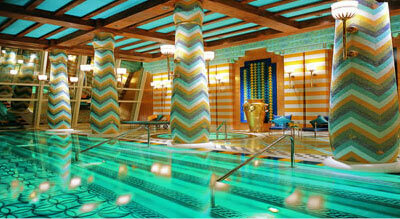 The Assawan Spa and Health Club is this Dubai 7 star hotel's spa and fitness center. The spa and health club is located on the 18th floor of the Dubai 7 star hotel offering an unrivalled view of the Persian Gulf. Over 5000 square meters of luxurious space, the spa has separate treatment areas for men and women guests. The massage and well-being treatments allow people to attain highest levels of bliss. The products are handpicked and only the choicest are used at the Assawan. Guests can also work off their stress or simply stay in shape at the state of the art gym with the help of fitness experts. Spa facilities include sauna, steam, cold plunge pool and infinity pools. The best way to attain world class nirvana is to try out Burj Al Arab's around the world massage. Traditional massage techniques like Shiatsu, Thai, Swedish and Balinese are offered at the spa. These are signature treatments and after 85 minutes there won't be any sign of stress or tiredness. Caviar is considered the most luxurious food in the world and now you can achieve a total makeover with caviar facial. Yes, it is slightly unusual. But this treatment guarantees a glowing complexion in just 70 minutes. For AED 1000, you can walk out looking like a dream. The Fingerprint facial is enough to pique anyone's curiosity. Well, it is nothing but custom made facial treatments to brighten, rehydrate or rebalance your complexion. The spa's therapists design special facials based on your lifestyle and skin type so that you get the best results. For AED 750, you can enjoy being pampered while your face is cleansed, oiled and moisturized. After a refreshing caviar facial, complete the feeling with a caviar body treatment. For AED 1200, guests can enjoy a reviving body massage treatment. After 80 minutes of being pampered, get the most delicious looking skin which glows and shimmers with a renewed vitality. Get rid of that extra flab and cellulite with Burj Al Arab's body contouring and firming treatment. Specialized massages tone your body and give you a tight figure. At the same time, you obtain soft and silky skin after this 90 minute treatment. If quality matters more than cost, then get the Assawan spa's rose rejuvenation ritual treatment. This treatment is a cool AED 1600 and after 115 minutes of facial and pressure point massage achieve ultimate happiness. With Moroccan rose and olive grains, your body is cleansed and polished and then enveloped in aromatic oils, cooling gels and creams of Damask rose.